First out of the gate, I want to state that I played the PC version of the game, and to be honest, I wish that I had a PS4 to play it on instead. The downside to Transistor's stunning art style, is that there are no graphics options to speak of, which is a problem when I was struggling to run the game at 20 FPS. The game is definitely very pretty, but it doesn't look like a game that should be particularly taxing. Perhaps this is simply an issue that will be resolved down the road via patching. I also felt as though the keyboard controls did not work very well at all, which was surprising given that they were fine in Bastion. It felt in general like much of the game's controls were a little sluggish, but it's hard to say how much of that was the low frame rate, and how much was my 360 controller being bad. I will say that, I played the game on a PS4 at Pax, and none of these problems existed. Platform complaints aside, the game is a joy to play. 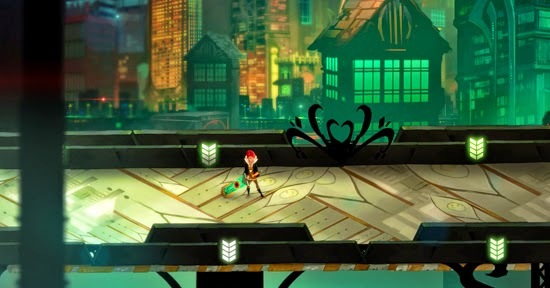 I mentioned earlier that Transistor is an action-RPG, and I am glad to say that it's combat is incredibly deep. It has two main things going for it: the function system, and the Turn() system. Functions are essentially your abilities, however each one can take one of three forms. You can assign it as an active ability, you can assign it as an upgrade to another function, or you can assign it as a passive. With 4 active abilities (each with 2 possible upgrade slots) and 4 passive slots, there is an astounding amount of flexibility in how you can choose to play. I also really like that, when your health bar depletes, rather than dyeing immediately, one of your functions overloads and temporarily becomes unavailable. It forces the player to replace that ability in the interim, and thus try out abilities and strategies that they maybe wouldn't otherwise use. To further add to the combat depth, is the turn() system I mentioned, which works something like the VATS system in Fallout 3. Essentially, any time you wish you can pause the combat, and input a certain number of actions, which you will then execute in quick succession. After turn() has concluded, you have to wait for it to recharge before you can use any abilities. This creates an interesting dance wherein you have to decide how much combat you want to do in real time, and when you want to use turn(). It allows you to use many attacks at once, but that isn't always what you want to be doing, and it leaves you vulnerable for a while. turn() is also not infallible. The game will predict how much damage you will do, if an enemy is out of range, if your attack will be blocked by terrain etc. This prediction is not always how it turns out though, and it encourages you to learn how your abilities and your opponents behave. 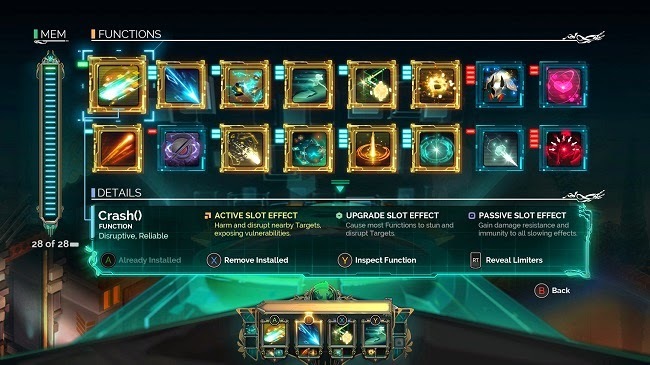 It's actually kind of astounding how good a job Supergiant has done of making sure that spamming turn() every time it is available isn't always the optimal course of action, but still a very deep and strategic system. Unfortunately, once we move beyond the realm of combat, things start to look a little bit less sunshine and lollipops for Transistor. I think the word I would use for it is "whimsical", though I saw someone describe it as "impenetrable", and I think that works well too. The problem Transistor has is that it makes no significant effort to explain itself to you. Certainly there is something to be said for leaving things up to the player's imagination. Supergiant chose this option at every possible juncture though, and you are left with a game that feels pretentious at best. The player is just dropped into this deserted city and has no recourse but to make their way from point to point. Nothing is explained explicitly or otherwise. None of the characters or locales are properly introduced or fleshed out, and you aren't given any good indication of what their motivations are. Everything just kind of exists. The Transistor itself talks constantly, much like Basion's narrator, and yet it feels like he never says anything worth hearing. There are tons of little interactive bits in the area, and yet they don't flesh out the world so much as say "hey, there's this thing here, isn't that cool?". On one hand the player is left to interpret things as they wish. On the other hand, I personally end up just feeling really confused by this empty void of a world and what seems like multitudinous plot holes. By the end of the game I had just kind of accepted that I wasn't going to get a cast of characters or a world I cared about. I accepted that nothing was going to make sense, nothing was going to be explained, and that I should just put my head down and enjoy the combat. Perhaps the game's narrative just isn't for me and someone else will be able to understand it just fine. I can certainly see it being something that some people do enjoy, but it most assuredly left a sour taste in my mouth. However that being said, I still enjoyed the game quite a bit purely on the strength of it's combat. 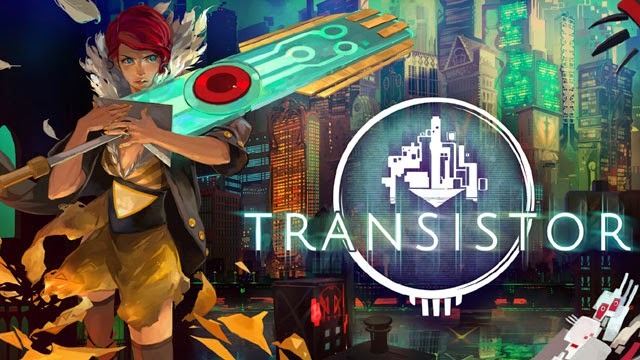 Luckily the minimalist approach the game takes to everything else means that it's pretty easy to pretend fighting the process is all that Transistor is about.